For more than four decades, All Masonry and Landscape Supply has been the leading supplier of premium fire pit and outdoor fireplace products in California. The fire features that we have supplied to our clients have adorned some of the most amazing private residences and commercial establishments in the state. We have also supplied home improvement contractors and DIY homeowners with premium masonry and landscaping materials that have helped them complete their dream projects. 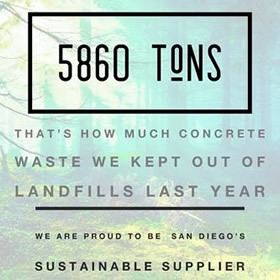 So if you want to be sure that you’ll get your money’s worth, buy only from All Masonry and Landscape Supply. 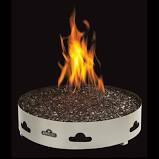 Our company supplies many of the finest prebuilt fire pits that property owners dream about. Likewise, we have top-notch masonry supplies for clients and contractors who want to create custom fire pits. Our creative people have some of the most awesome fire pit ideas that allow them to help clients visualize exceptional BBQ pits and regular fire pits as well. 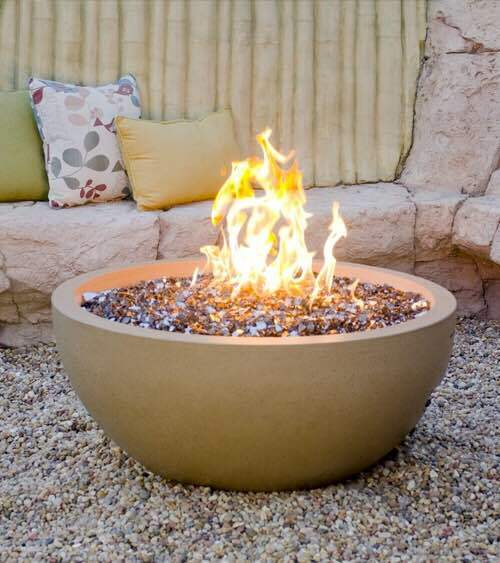 When you contact us, you’re assured that the pre-manufactured or custom fire pit that we’ll provide you with is manufactured from premium materials. More about Fire Pits. . . Spending time outdoors during cold winter nights and days will never be comfortable unless you have an outdoor fireplace installed in your property. 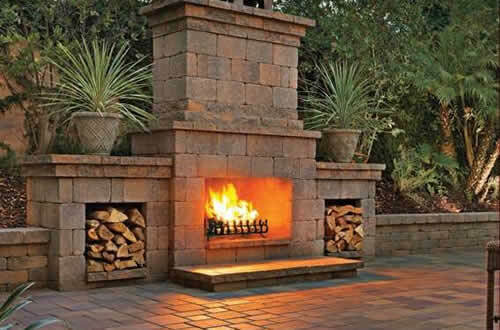 Be it a stone fireplace or one made of premium brick materials, our people can offer you unique fireplace ideas that will help make your outdoors an inviting place. We have in our inventory small to large pre-made outdoor fireplaces from our trusted partners, like Belgard and Harmony Outdoor Living. The great thing about each fireplace that we sell is its fine aesthetic appeal that can enhance your outdoors’ look and make it more enticing for your family and friends. 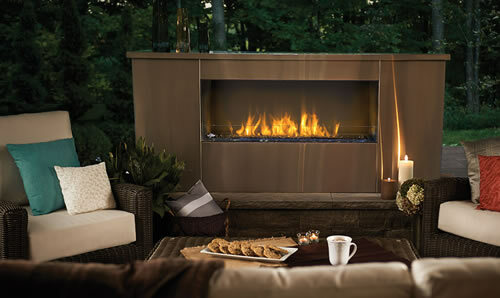 More about Outdoor Fireplaces . . .
A great option aside from a wood- or coal-fired fireplace is one that is fueled by natural gas. As it is, a gas fireplace offers you the convenience of just turning some knobs to start a fire, instead of having to first burn wood or coal. Our gas fireplaces and gas fire pits are great add-ons for any outdoor space. You may also want to go for propane fire pit to have smaller yet excellent option to keep yourself warm when you stay outdoors. More about Gas Fireplaces . . . Fancy some weekend barbecues and al fresco dinners? Then why not have include BBQ and gas grills for your outdoors? 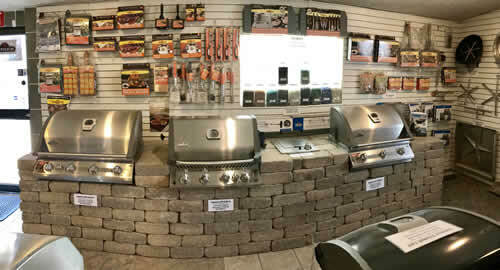 We have access to top-notch BBQ units from the finest manufacturers of outdoor living products. We also have partner suppliers who can provide us with your needed gas grills. Accordingly, our friendly personnel can help you install these outdoor living amenities in strategic areas around your yard. Let us help you make your outdoors the place you want to be! More about Outdoor Grills . . . The key to fully enjoying the benefits of an outdoor barbecue is to have the necessary accessories. 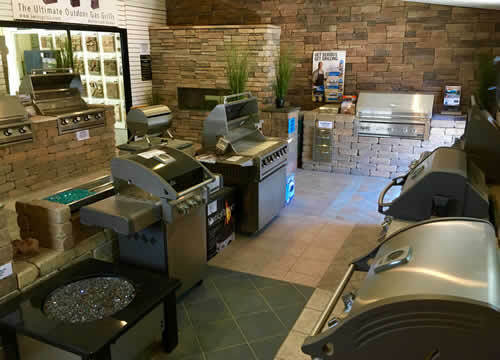 Our clients are always delighted for we have a complete range of premium quality accessories intended to maximize the benefits that an outdoor BBQ can give. And all at very affordable prices.